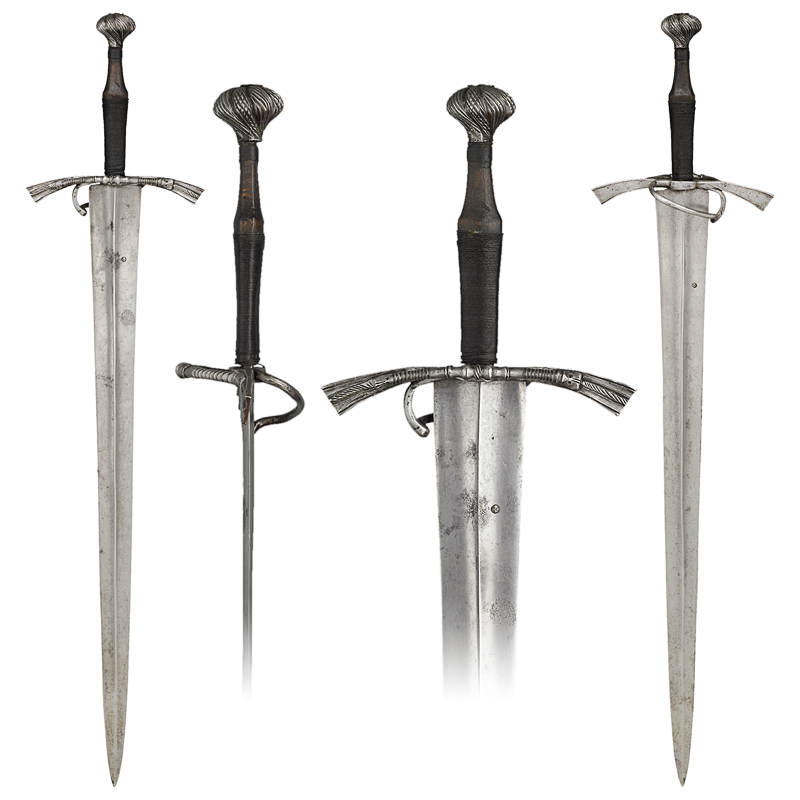 For many years I have been eyeing up sword A479 at the Wallace Collection in London and wanting to make a reproduction. I couldn't justify it for myself, but a couple years ago I went to visit the Wallace organised by Ryan Renfro with Julien Messenge and we discussed making a replica and so it began. I found another customer to make it really worth doing and so here we are. The sword is an iconic piece as well as an enigmatic one. The appearance is very striking, due in part to the wide, spined blade; the irony being that the 'original' is a composite piece. 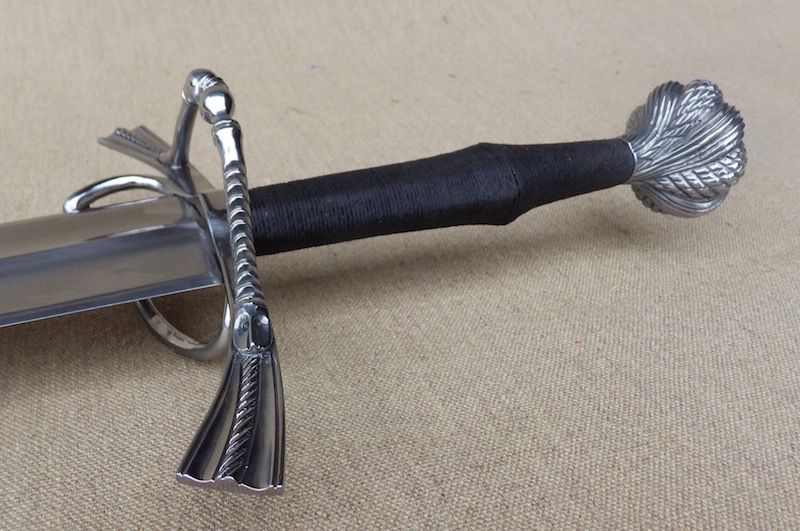 This is very simple to establish in that the finger ring on the guard is unusable as it stands now and so the blade is too wide for the hilt. This in turn brings into question the originality of the grip. 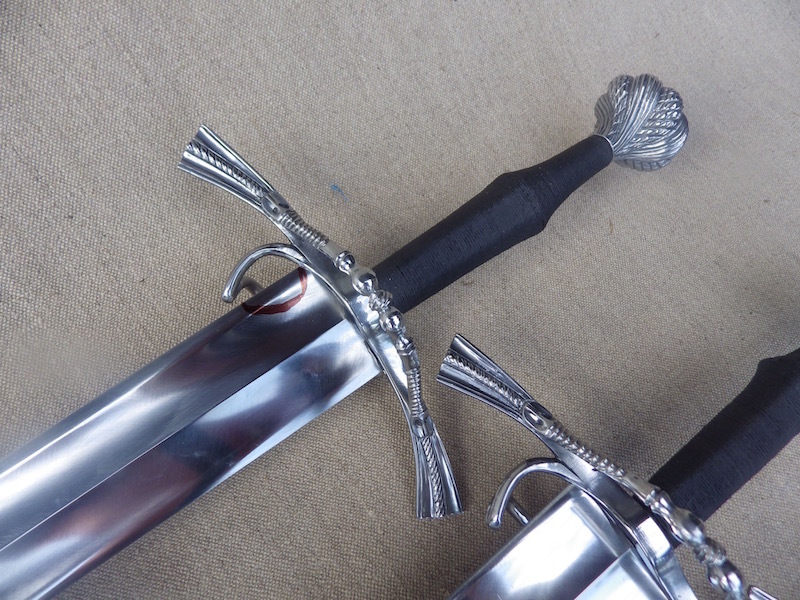 That aside I love this sword as do my clients, so we decided to keep the look as per the piece. 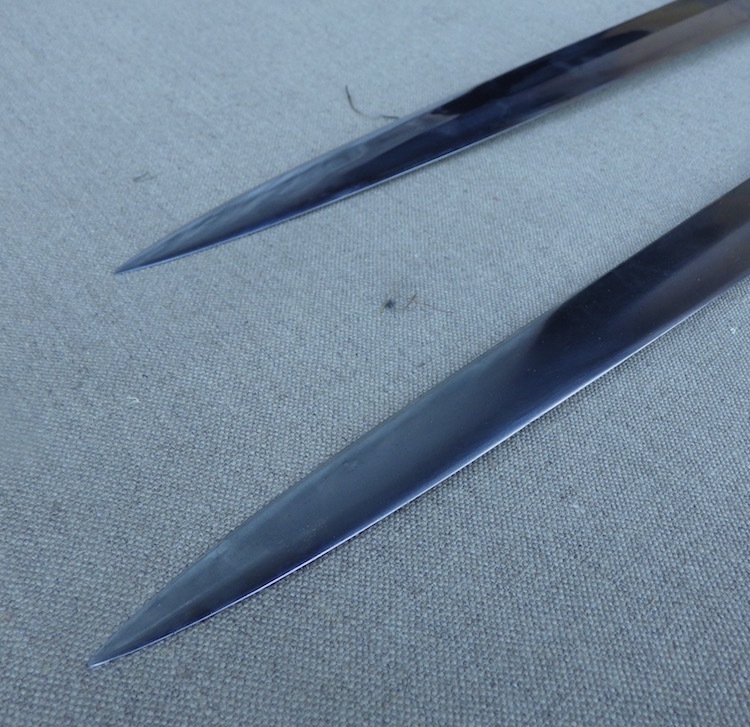 The blade is 66mm wide and 10mm thick at the guard and has a slightly smudgy central rib that is formed as a radius that then rises slightly toward the edge before the soft appleseed bevel. It makes for a surprisingly light (for its size) and stiff blade, but with a tough edge. The guard and pommel are curious also because they have that classic aspect so often seen on originals in that from 2 meters or more away it looks stunning but in your hands up close it is rough as hell. Good for posing/easy on the purse. I tried to keep some of this crudity in my repro, but actually made it cleaner than the original as if it was as rough, I could never have sold it. Same is true for the blade. The grip is black waxed cord over a wooden core and whether it was ever covered with leather we don't know, but have opted to keep the cord wrap as the finish. I hope you like it and if you have any comments let me know. 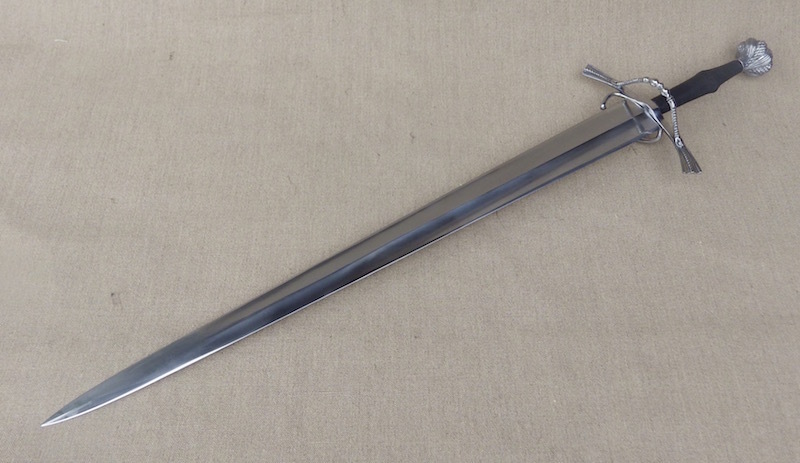 I have 3 of these to make and each will inevitably be a little different in terms of the blade, so I will put up stats when I have made the trio, but the first one is around 40g overweight from the original. Scabbards to come for at least two of these. Three! And not one of them mine! Oh, well...This one has always captured my imagination, and your interpretation is perfect. Composite or not, I'm glad you and the client chose to be true to the piece as it exists now, at least for one of the three. However/whenever those components came together, the overall effect and proportions are most satisfying. The broad blade and terminal figures of the side ring make the design seem almost heroic. This project and your Henrician saber are probably my two favorites. Beautiful work! What a brute! And a fantastic one at that! I was hoping that someone would someday recreate A479 and here it is - quite beautiful. Could you please give us a few more specs? 10mm thick to start, but what kind of distal taper does it have as you go down the blade? Quite a bit, one would think. So damn impressive, Tod. You seem to have gotten extremely close to the original. Dang, that's really, really nice! An awe striking conversation piece in any collection. Very good sir, and thank you for sharing! I can't wait to see more of them, and the scabbards. Tod yours seems to be more perfect. I'm curious scabbard. Thanks everybody for your very kind comments, they are really appreciated. It was a pleasure making this (more or less) and even the blade was not quite as bad as I thought it would be. 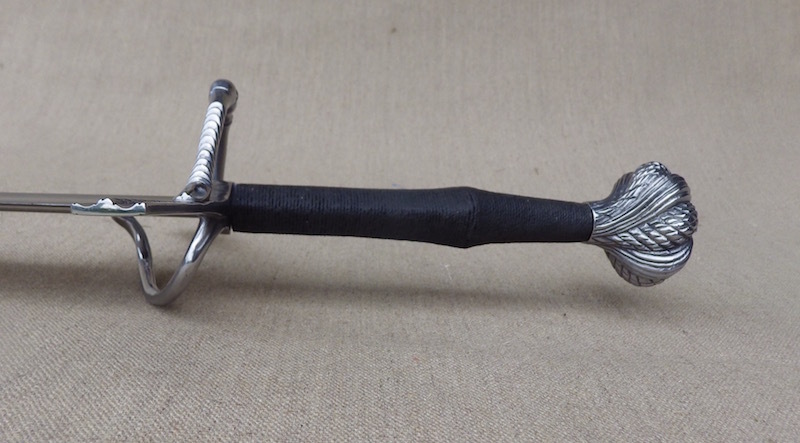 A very similar hilt was shown from Hermann Historica and again a chap posted another on my timeline from the VandA - very similar, but both with narrower blades. 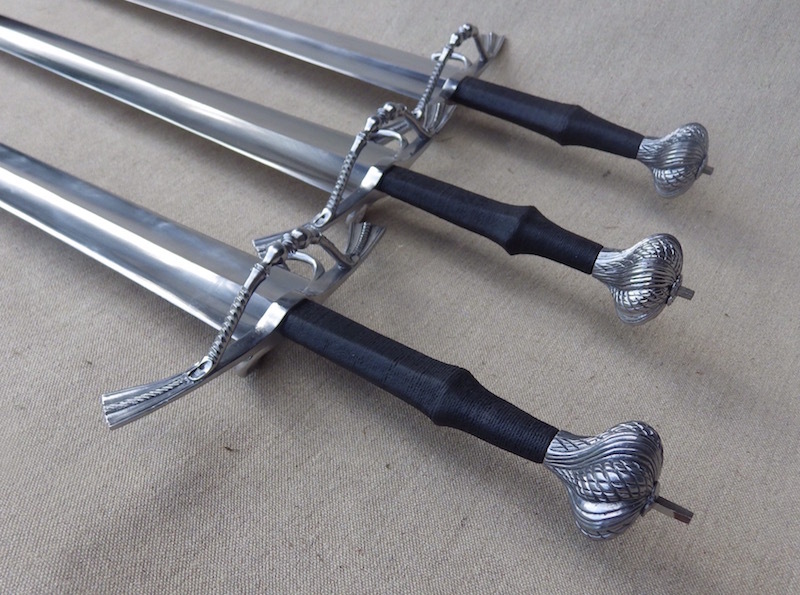 Here are some pictures with two swords and the third is now in production. As I said before I have struggled to work out the best way to tackle the blade and and of course small variations in blade thickness changes how the hollow grinds interact with the edge, so it has been an adventure. I have tackled each of the three blades in slightly different ways, so the weights and feels will be a little different on each. So as you can see, the taper drops rapidly and then stays fairly steady and drops rapidly again near the tip. This second blade I have also taken the hollow down further toward the tip as per the original. Again any questions or comments please fire away. And I've been thinking about the finger ring. What if you were left handed? Dude!! I love those! Very cool. I assume the distal taper stats are based on measuring the original? Wow, wow, wow! I mean just...wow. Jamais deux sans trois! I'm thrilled to see this project progress and I can't wait to check these out in person. The work on the hilt is absolutely outstanding - I will have to go back to our shots from the wallace to spot differences with the original. 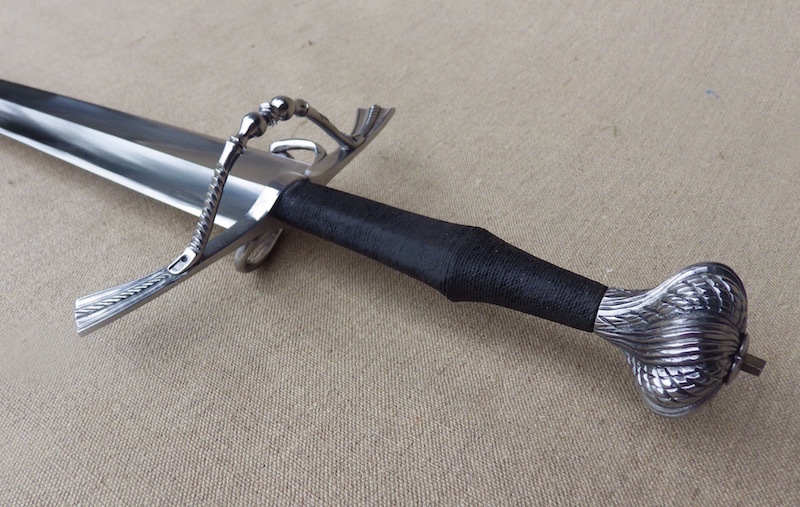 THIS IS ONE OF THE BEST SWORD WHICH I'VE EVER SEEN !!! Exemplary work, as ever Tod. 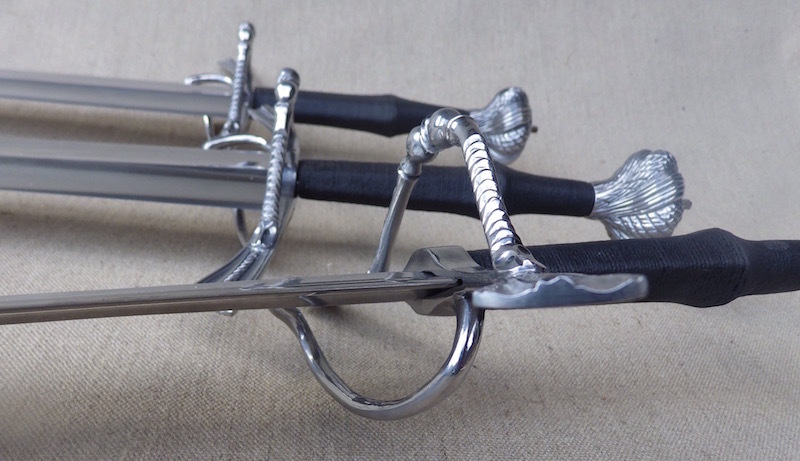 I'm curious about the ring guard - is that welded onto the quillons or forged from the same stock? Well thank you very much for those compliments and really to be honest I think it is a bit much. 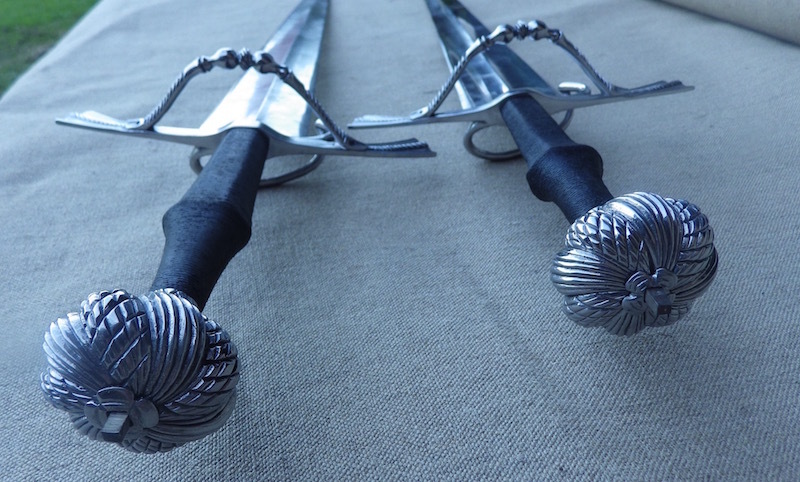 Both Mateusz and Lukas produce excellent swords and though this may be a little different to normal, it is certainly no better - but again; thank you. Lukas, yes the stats came from the original. Well neither I am afraid to say. 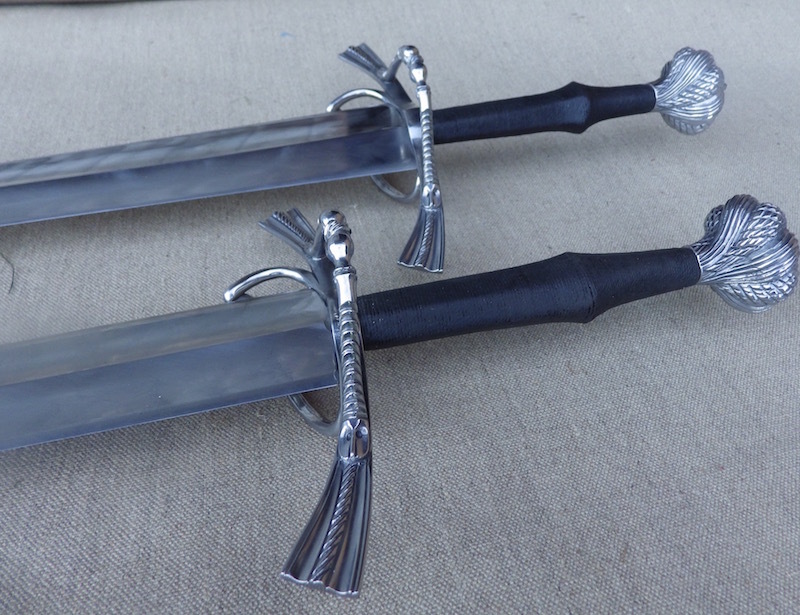 For budget reasons, I carved these in wax and cast them in a medium carbon steel. 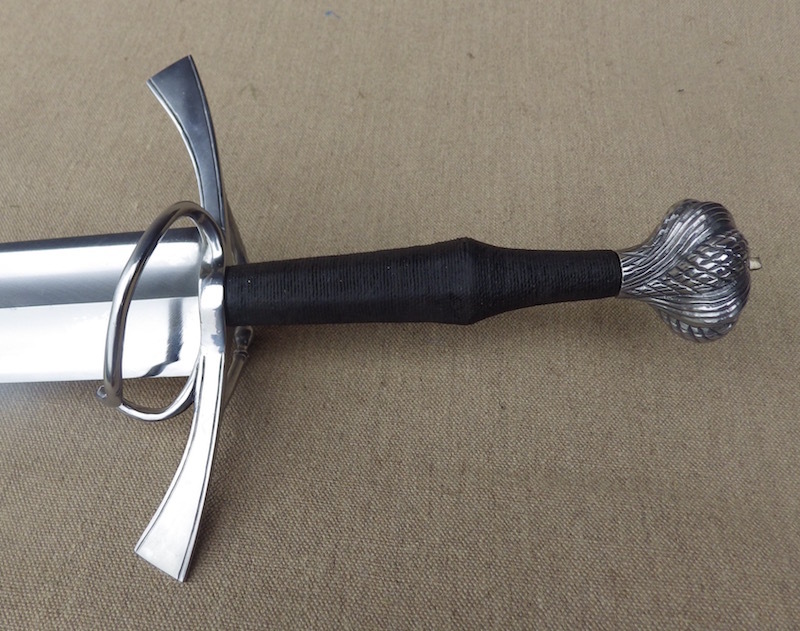 The guard is not so hard to make, it just requires a bit of time and some filing, but the pommel is a different matter. Because of its shape, a great deal of it cannot be filed it has to be cut/chiseled and then cleaned up with scrapers and there is no tool (at least that I have) that will do this in a freehand way so really it is down to small chisels like it would have been done 500 years ago, the only difference being that labour is more expensive now...I don't know, but it could easily be a £1000 pommel and so that would take the whole project out of my customers means. 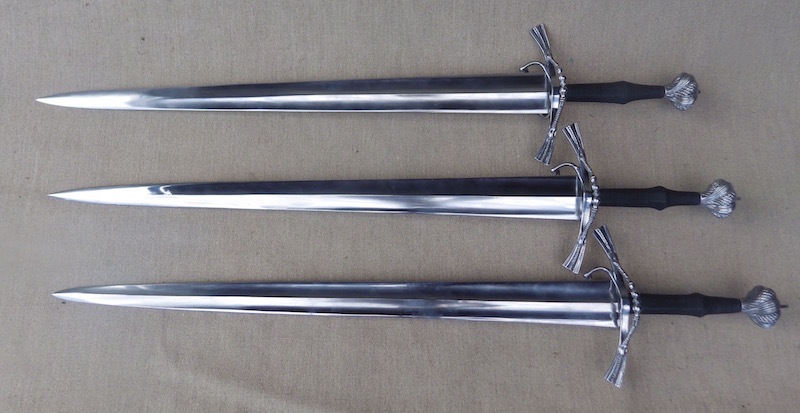 So in the case of these swords they have been cast as one piece. Sorry. I also sadly ddi not see how the ring guard was fixed, though a close look at the Wallace pictures may show, but it was well done. It would almost certainly be made as a separate piece, because there would be very little benefit in splitting off a section and forging that when you can weld it easily enough and save a load of time. So I don't know for sure, but I would say this was welded. That said brazing it would also be fine and I suspect that you will see variation in the 3 very similar swords we know of. Brazing was good enough to fix the flags on flanged maces, so good enough for this if that was the chosen route. Thanks for those details, Tod! Any plans on selling guard and pommel sets, finished or rough? The last of the three swords is now finished and again I tackled the blade in a different way and this time I think I really got it right. The overall weight of the sword is around 10-20g higher than the original which I am very pleased about and I guess means I am on the right track. So here are the three together and I hope you like them. 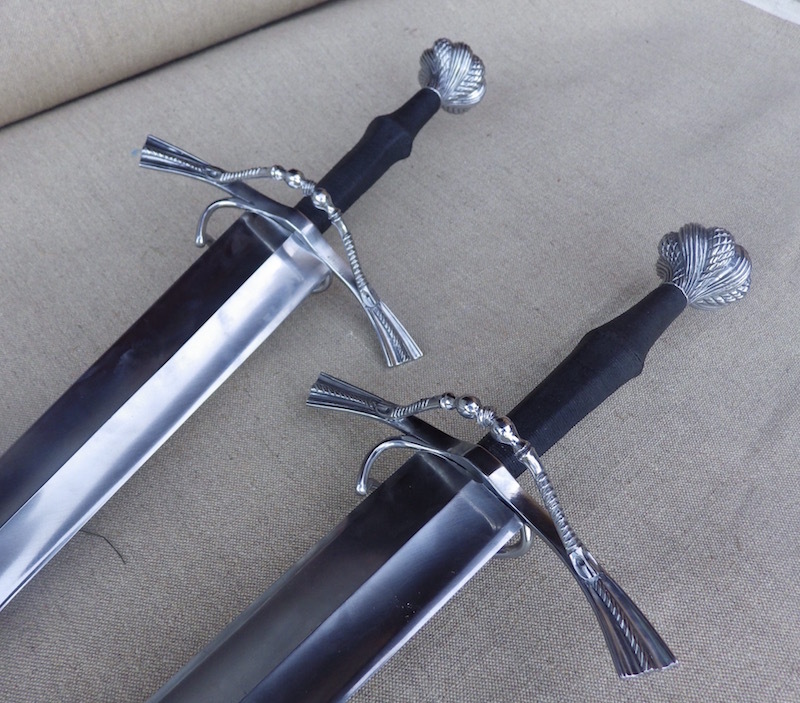 Not only do I make daggers, swords etc, but I am a re-enactor and yet I still do not have a single dagger, sword, scabbard, bow etc that I have made myself and so I think that one of these swords needs to be mine. With that in mind, I am debating whether to cut a finger recess into the blade so that the finger ring works as it should. Because the blade is in effect too wide for the guard, this feature was lost. 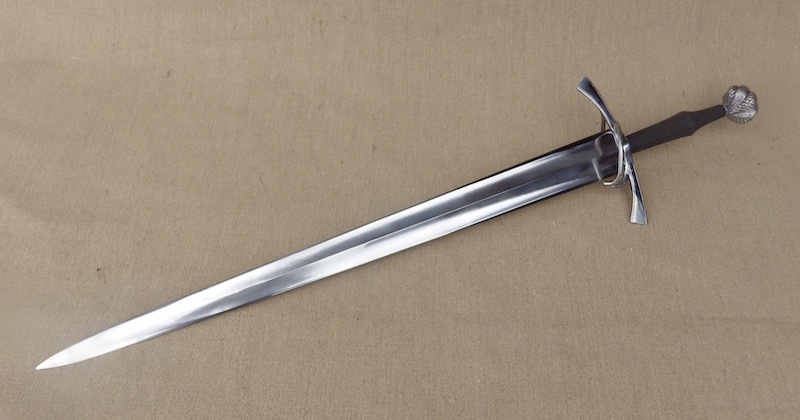 My rationale is that if the sword was composited in the medieval period, the owner presumably liked the old blade, wanted a new hilt and so needed to cut into the blade to make it work; I am pretty sure I have seen this done. I would appreciate your thoughts. Should I do this (brown line on last picture) or leave it pure as it is. What would you do? 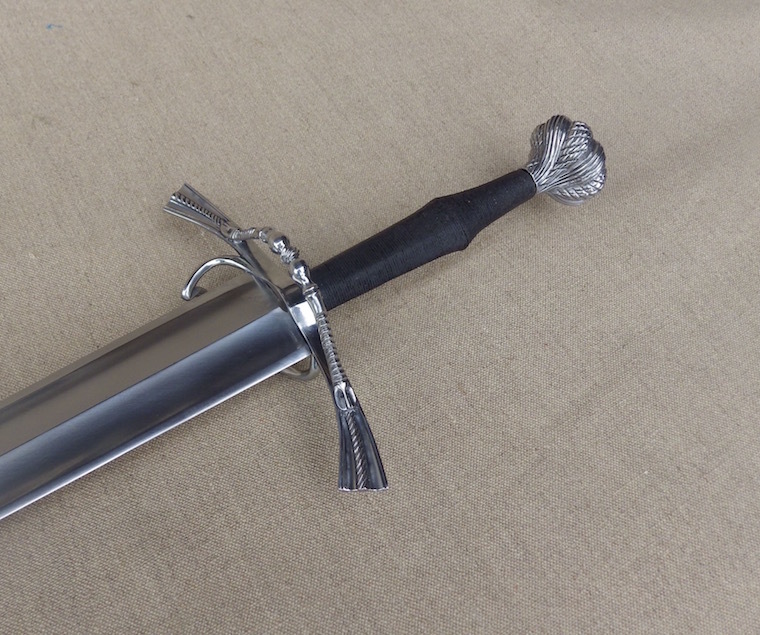 The next step will be a scabbard for mine and then probably another for one of my clients, but that will be a while. Beautiful work Leo. The original is one of my favorites. Are all of these spoken for?